Dubai, United Arab Emirates –4 February 2019: Impact assessment of the 2018 Dubai Fitness Challenge (DFC) emphatically confirms the strong and growing resolution of the city to become the most active city in the world – as both residents and visitors embraced the societal movement spearheaded by His Highness Sheikh Hamdan bin Mohammed bin Rashid Al Maktoum, Crown Prince of Dubai and Chairman of Dubai Executive Council. The 30-day city-wide Challenge, held between 26 October to 24 November 2018, saw an unprecedented 1,053,100 people lead the change, undertaking the long-term commitment to a healthy and active lifestyle. Beyond recording a 34 per cent increase from 2017 (786,000 participants), the second edition also saw engagement setting a new bar at 92 per cent, up from the already high 90 per cent level in 2017. The 30x30 Challenge featured a larger, more inclusive and interactive programme, with an extensive range of fitness and sporting activities including 8,000 workout sessions, free-to-attend activations, wellness workshops and training sessions across 250 locations – allowing all residents and visitors across age groups and fitness levels to fulfil the target minimum of 30 minutes of daily activity. In addition, to motivate, empower and inspire the masses, DFC rallied the support of a host of international celebrities, sports and fitness personalities that ardently championed the cause, including Marcus Smith – who ran 30 marathons in 30 days; Sir Mo Farah, the most successful British track athlete in modern Olympic Games; Team Angel Wolf – with #TogetherWeCan community programme created for People of Determination; and fitness gurus Chris and Heidi Powell amongst others. Ahmed Al Khaja, CEO of Dubai Festivals and Retail Establishment (DFRE) said: “The second edition of Dubai Fitness Challenge, an incredible initiative of His Highness Sheikh Hamdan bin Mohammed bin Rashid Al Maktoum, has dramatically changed the mindsets of people towards achieving positive social and lifestyle changes. Our recent consumer research that compares pre and post DFC behaviours to assess tangible impact, reveals extremely high satisfaction scores across all aspects of the festival itself, in addition to a marked improvement in lifestyle choices. These are strong indicators that this city-wide movement is turning into a social platform for good health, and by extension, well-being and happiness of Dubai's entire community. “The success of DFC's second edition is thanks to the incredible collaboration between the public and private sectors. Indeed, the individual dedication, collective efforts and above all, the unifying passion of all stakeholders – from government entities to educational institutions, healthcare providers to utility companies, banks to developers – have enable us reap such rich sustainable dividends. In addition, DFC delivered on its ‘inclusiveness' promise by showcasing a wide representation across age segments and equally reflecting the diversity of Dubai's society – with the largest participation recorded from Indians (31 per cent), followed by Filipinos (11 per cent) and Emiratis (10 per cent), in addition to several thousands of residents from Pakistan, Egypt and the UK – all enthusiastically taking on the month-long challenge. More than half of the participants were students in 2018; with schools accounting for 55 per cent of the registrants, strongly growing their representation from 44 per cent in 2017. This achievement falls in line with DFC's aim to instill the importance of leading a healthy lifestyle among students to help nurture and sustain life-long health and fitness habits among the youth. Beyond absolute numbers growth, 92 per cent of participants achieved the target of the 30x30 Challenge, compared to 90 per cent during DFC 2017 with an incredible 61 per cent of participants recording at least 30 to 60 minutes, 21 per cent 60 to 90 minutes and 10 per cent over 90 minutes of daily activity. 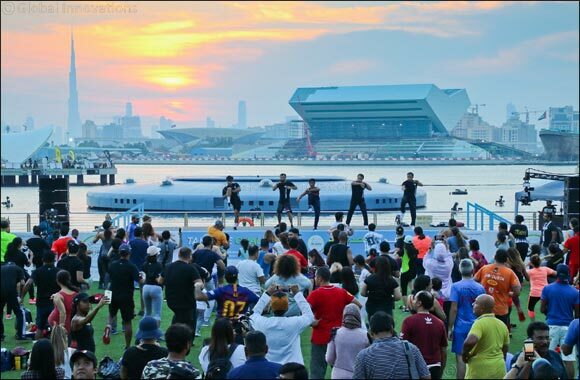 Reflecting the positive impact of greater access and improved calendar of programmes, 41 per cent participated in DFC activities compared to 33 per cent in 2017, and all five DFC Fitness Villages drew significant participation with DMCC Fitness Village, Kite Beach Fitness Village and Palm Jumeirah Fitness Village being used most regularly by the people. “Based on the public response and measurable outcomes, we are encouraged to see DFC delivering in line with the vision and expectations of His Highness Sheikh Hamdan bin Mohammed bin Rashid Al Maktoum. We are confident that 2019 will only draw even greater city-wide participation, and we will continue to work with the support of our partners and the community to make sure that we forge a life-changing legacy of health and happiness”, said Ahmed Al Khaja in conclusion. Overall, the 30-day Challenge delivered against its objectives of positively impacting societal wellbeing across a broad spectrum of sporting and fitness activities. The top activities of DFC 2018 were Aerobic & Cardio activities, Running, Walking, Jogging, Yoga, Zumba, Pilates, Weightlifting, HIIT, Circuit, Football, Cricket, Basketball, Swimming, Kayaking and Diving. 2018 also saw more DFC fitness events attendees, complemented by the newly updated Dubai Fitness App that helped drive higher public engagement during the 30-day Challenge. 54 per cent of residents used the App on a daily basis during the Challenge; slightly higher than the daily usage patterns observed in 2017. Walking (30 per cent) and running (20 per cent) were the top two tracked activities of participants using the App. The App will continue to help DFC participants maintain their 30 minutes of daily exercise far beyond the duration of the Challenge, with 18 per cent of participants using the App as motivation to stay active. Compatible across all devices, the App is available free on the App Store for Apple iOS and Google Play for Android, and can be synced with other top fitness apps such as Fitbit, Strava and Apple Health.